Great voice, great song! Nice work! This is a perfect song for Cameron. This is one of my fave song from Cameron... :) love this so much. 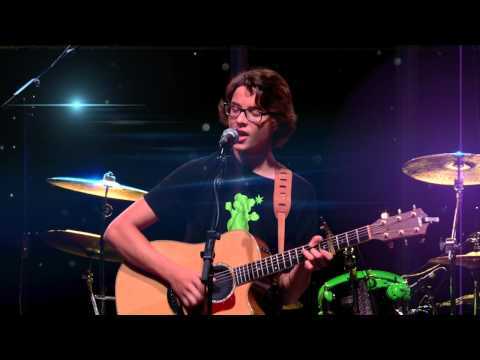 14 year old Canadian recording artist Cameron Molloy is a natural born performer. His seemingly effortless ability to deliver captivating vocal performances and relaxed stage presence are rare qualties for such a young performer. Molloy’s ability to take charge of his instrument in hand, along with his incredible songwriting skills, make this humble soul a definite gem. His first self-titled EP release that is available on ITunes, CD Baby and Amazon is an eclectic blend of genres that showcases his multitude of music personalities. This collection of catchy songs were influenced by his experiences as a young child and inspired by his closely knit family of music lovers, who took him on adventures to a multitude of festivals and special events. His current follow-up single called “A Word in Every Whisper” is a testament to his Maritime roots, that showcases his phenomenal ability to deliver exceptional lyrical content and memorable melodies that listeners believe were crafted by an industry veteran. Cameron enjoys all opportunities to perform and excels in music, school and sports alike. Following numerous coffee house performances at the age of eight, he was inspired to embark on his songwriting career. His relentless and prolific dedication is a testament to his destiny to create a deep catalogue of exceptional songs. Following performances at the New Brunswick Country Music Hall of Fame gala and his duo performance at a sold out Casino New Brunswick show, audiences were left in awe and on their feet by this young gentleman of the stage. He rose to the top nine contestants in the “YTV Next Star” competition out of 7,000 participants and performed on numerous television broadcasts during the competition. At the “Road to Stanfest Songwriter’s Workshop” numerous acclaimed musical artists leading the workshop, referred to Cameron Molloy as one of their peers. He was invited to perform the song he wrote during the workshop at the “Stan Rogers Folk Festival”. His passion for giving back to his community is another character trait that speaks volumes for this young artist. He performed at countless charity events that include performances at; The Riverview Arts Centre in support of the arts, the Christmas Daddies/Tree of Hope event in support of cancer initiatives and Hockey Heroes for the Heart and Stroke Foundation. Cameron is a lover of spicy foods, healthy fruit smoothies and positive choices in every realm. Although very occupied with his musical pursuits, Cameron finds the time to be a straight A student and competitive AAA hockey player.